The Samsung Galaxy S10 and Galaxy S10+ is a brilliant piece of smartphone technology. The most eye-catching and innovative front camera cutouts are simply awesome and out of the text. The Galaxy S10 and Galaxy S10E do come with a single selfie camera with an in-hole cutout. While the bigger and better Galaxy S10 Plus comes with dual front camera holes. However, you can easily hide the cutout area with inbuilt notch hiding option. But that doesn’t come in handy and takes a lot of bezel on the upper side. Here are the links to Download Samsung Galaxy S10 and S10+ Camera Cutout Wallpapers. Samsung has already provided some beautiful abstractive and minimalistic light and dark shaded stock wallpapers. These wallpapers fits perfectly and crafted to hide the front camera holes perfectly which gives a more premium look. Meanwhile, the camera cutout also looks great and gives an unique feeling. Still, those who are an advanced Samsung Galaxy S10/S10+ user or wants to be customized, these wallpapers will be great for you. The Matt B has showcased his masterclass by sharing a few Galaxy S10 & S10+ wallpaper mockups on Twitter. Inspite of the unofficial wallpapers, this man showed his creativity and perfection at its best. These perfectly crafted camera cutout wallpapers has featured some of the characters like Johnny 5, NASA Mars rover, minion, wall-e, Bender from Futurama etc. All of these characteristic wallpapers fits perfectly on Samsung galaxy S10/S10+ devices. 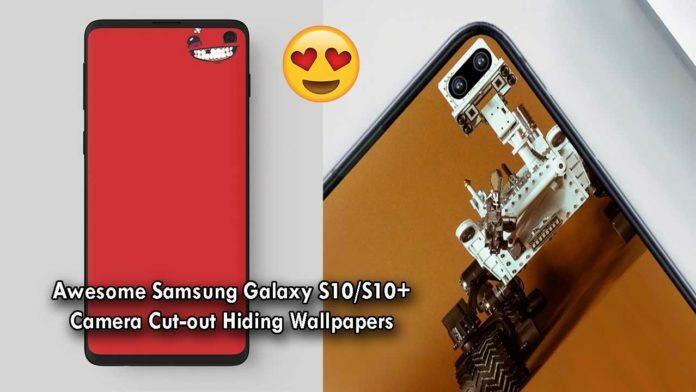 While the single front camera cutout on the Galaxy S10 has also the characteristic wallpapers like Mars Rover, R2D2, Super Meat Boy etc. You barely notice the selfie camera hole on the display while using these awesome wallpapers. Now, you can download the actual wallpapers to hide and give an unique look to Galaxy S10 series smartphones easily. Grab the wallpapers from below link provided individually for both Galaxy S10 and Galaxy S10 Plus handsets. Just download the (.zip) file and extract it on your device. Then go to the wallpaper settings option directly or to the gallery app and select any of them. Now, set any wallpaper on your device home screen or lock screen easily. Don’t extend iMessage to Android. Make a universal messaging standard instead.